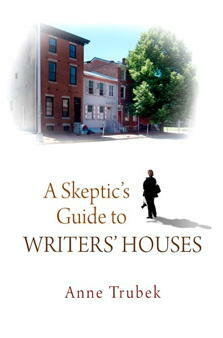 But A Skeptic’s Guide is entertaining precisely because, for Trubek the houses always come up short, which she describes in a pleasantly un-snarky way. For example, visitors and tour guides often seem to confuse the idea that a house was where the writer lived and not where the fictional characters like Huck Finn or Jo in Little Women lived. The furniture, papers and other items in the houses are often not those that belonged to the writer, but are things the curator added willy-nilly. Edith Wharton’s home, The Mount, is decorated as a modern-day show house, computer and all. Most houses seem to have the same array of merchandise in the gift shop. I agree with her. I’ve never really seen the lure of an author’s homes as some way to commune with the departed genius or magically attain the writer’s magic for my own use. However, I’m fascinated with the sense of place that literature creates. When I read about Huck Finn, it makes me want to not visit Twain’s Hannibal home but rather to hop in a boat and travel down the Mississippi. For a Yankee like me, it’s exciting to visit the Carolina lowcountry I’ve read about in books such as Pat Conroy’s Prince of Tides or The Water is Wide. I get a better understanding of the real people who live there as well as their history and the geography that has shaped it. This entry was posted in Ideas for Book Clubs, travel and tagged a skeptic's guide to writers' homes, anne trubeck, literary travel, reading, travel, writers homes. Bookmark the permalink.